Diary of a Mundane Astrologer: Connecting the Saturn-Pluto dots: McCarthyism 2.0? Connecting the Saturn-Pluto dots: McCarthyism 2.0? It’s hard to focus on anything these days but the cruel attempts to decimate American health care on Capitol Hill, but today, I’m focused on another shady, destructive story that’s been unfolding right under our noses. There's an important astrological story here. So my purpose here is to connect some important astrological dots. The story above was largely forgettable because a much more dramatic event was looming on March 20th, and the nation is still trying to digest and make sense of it: the Senate Intelligence Committee’s open hearing into Russian interference in Election 2016 and the possibility of ties between that Russian effort and the Trump campaign. Two key revelations emerged from that hearing: FBI Director James Comey testified and 1) repudiated Trump’s baseless wiretapping claims, and 2) confirmed that there is an ongoing investigation into connections between the Trump camp, Election 2016 and the Russians. Clearly, we’re starting to see a much more complex bigger picture, with deeper and deeper layers of deceptive intrigue emerge in this whole story. Have we fallen into a 1940s “Noir” spy thriller dream? Sure seems like it! Congressional investigations can’t help but evoke memories of the 1970s Watergate hearings—and as we’ll see, there would be a good astrological reason for that—but there’s another, even juicier astro-historical precedent for these shocking Senate hearings that deserves a look-see because it, too is being echoed persistently. I’m speaking, of course, about the 1940s-50s McCarthyist era. 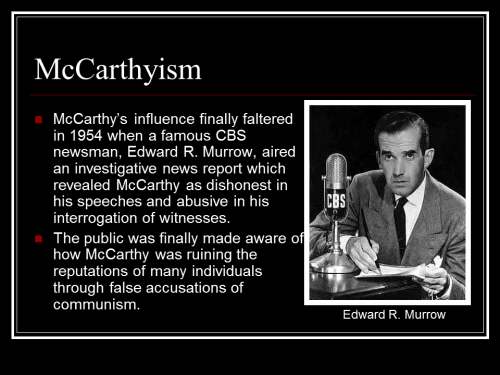 “McCarthyism is the practice of making accusations of subversion or treason without proper regard for evidence. The term refers to U.S. 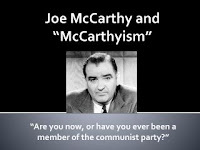 Senator Joseph McCarthy and has its origins in the period in the United States known as the Second Red Scare, lasting roughly from 1947 to 1956 and characterized by heightened political repression as well as a campaign spreading fear of influence on American institutions and of espionage by Soviet agents. Artists and writers in Hollywood and on Broadway, and union leaders across America, were particularly targeted for official loyalty “screenings” by McCarthy’s House Un-American Activities Committee (HUAC). In fact, McCarthy’s ally in paranoid power at that time, FBI Director J. Edgar Hoover, was always on hand to investigate and intimidate anyone with even a shred of liberal-thinking. 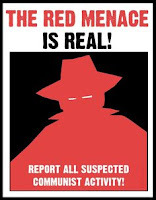 Hundreds of careers were thrown on the rocks by this intimidation, which often involved forcing interviewees to “name names” and implicate colleagues and others as “communist sympathizers.” The specter of “Commie infiltration” danced in front of McCarthy’s eyes like a band of sugar plum fairies—and no one was safe from his committee’s twisted scrutiny. To be sure, there were card-carrying communist and socialist party members among American citizens at that time: in fact, it is perfectly legal to have such affiliations under our First Amendment. By 1947, however, the powers-that-be had developed a high stakes reason for not welcoming Soviet influence within the country, and it was a simple “connect-the-dots” exercise in their minds between that influence and those holding left-wing views. Among other priorities, we were, at that point, the only nation with a nuclear weapon, and the powers-that-be wanted to keep it that way. The reasoning behind Truman’s Executive Order may have been sound, especially so soon after confronting the horrors of Nazi Germany, but its intent was too easily abused. In retrospect, since we had actually used the “Bomb” to end the war with Japan, it was perhaps a good thing that we didn’t continue monopolizing that horrific power. The “MAD” (mutually-assured-destruction) balance of powers that developed between the U.S. and Soviet Union over nuclear power helped to check against recklessness, even if the arms race itself seemed ludicrous. MSNBC.com reports that on August 29, 1949, the Soviet Union tested its first nuclear weapon, triggering the nuclear component of the Cold War (and a major panic) in U.S. security circles. When Truman announced this test to the public in September, the so-called “Second Red Scare,” which had been heating up like a bed of coals, burst into flame and spread quickly. 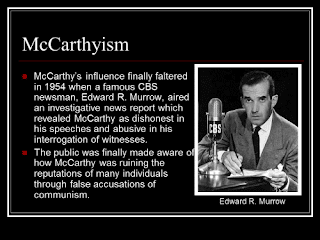 This panic presented a major opportunity for McCarthy and those of like-paranoid mind: his hearings became the equivalent of a 20th century “Inquisition” in which he was the “celebrity” windbag fanning those “Red Scare” flames. To begin appreciating the astrological dynamics at work during this period—and to see why this paranoid period resonates today—let’s consider the charts. First, a triwheel between the U.S. Sibly chart, Joseph P. McCarthy and the 1st USSR Atomic Test in 1949. We will then consider how that history echoes today, as we live out the last 3+ years of the current Saturn-Pluto cycle. Triwheel #1: (inner wheel) US-Sibly chart, July 4, 1776, 5:10 p.m. LMT, Philadelphia, PA; (middle wheel) Joseph R. McCarthy, November 14, 1908, 3:00 p.m. ST, Grand Chute, WI (rated A: memory); (outer wheel) 1st USSR Atomic Test, August 29, 1949, 12:00 p.m. (noon chart, no exact time known) ST, Moscow, Russia. All charts use Tropical Equal Houses and True Node. Interchart Cardinal Grand-Cross: Test Mars (Cancer) opposes Test Jupiter (Capricorn), overlaying Sibly Mercury-Sibly Pluto opposition (Cancer-Capricorn); this axis squares McCarthy Mars (Libra) opposite Sibly Chiron-McCarthy ASC. Setting off that atomic test was certainly a “shot across the bow” of the powerful Sibly 2nd-8th axis on the Soviets’ part, and we can appreciate here why it panicked an array of American interests. National security (Cancer) is always very closely related by house placement (and by Pluto’s role in Capricorn) to resource-related and financial interests in this nation, and the American press (Sibly Mercury) is always an important player, as well: this one Mars-Jupiter opposition set off alarm bells in all those arenas and steeled American opposition to the new Soviet threat. 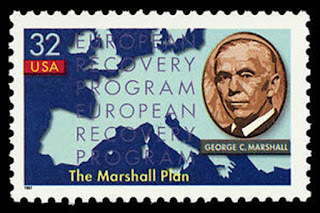 It’s hard to say if the perversions and abuses of power that arose over the course of his anti-communist campaign were inevitable, but with McCarthy’s Mars sextile Sibly Neptune (Virgo), the cause that drove him was empowered by the myth of American “exceptionalism,” so prominent in those post-World War II days, a myth that’s easily corruptible (Neptune). McCarthy’s Mars also trined Sibly Mars (Gemini), suggesting he was fully invested in battling American adversaries. This 1949 Mars-Jupiter opposition (outer wheel) was an expression of “expansive power” and clearly there was an aggressive power-consolidating intent, masked as a “security” concern (Capricorn-Cancer). The Soviet Union wanted parity of power with the U.S. then, and its spin-off Russia wants it again now—the only difference is the choice of weaponry. As we’ve seen in Election 2016, cyber-warfare can undermine an enemy just as effectively as building a nuclear arsenal ever has, and it’s also a lot cheaper. We would expect the Soviet atomic weapon test to be a literally shocking, explosive event, and we certainly see that here, with Test Uranus (Cancer) conjoined Sibly Venus-Jupiter (Cancer)—the test was also clearly aimed at making an impression (Sibly Jupiter rules the chart’s ASC; Venus rules the military Taurus 6th house and the legislative Libra 11th). The Soviets might have exploded their bomb somewhere else, but its message was definitely aimed at us, and McCarthy saw the opportunity. His Part-of-Fortune-MC (Capricorn) opposed Sibly Venus-Jupiter and Test Uranus, and this axis fell square his hardnosed Saturn (Aries): it seems that the Soviet Test presented him with an opportunity to shine by waging his own brand of war. Interchart Cardinal Grand-Cross #2: Test Venus-Neptune-SNode-McCarthy Venus-Sibly Saturn (all Libra) oppose Sibly Chiron-McCarthy ASC-Test NNode (all Aries); this axis squares McCarthy Neptune-Sibly Sun (Cancer) opposite McCarthy Uranus (Capricorn). This complex set of tense oppositions and squares reinforce how well-suited McCarthy was to the ideological crusade he brought to Congress and how controversial and stressful it all became. It’s a well-worn cliché that if we don’t take history seriously, we’re doomed to repeat it: unfortunately, it appears there is an effort to purposely repeat the McCarthyist era, only this time, replacing the anti-Communist angle with an anti-Muslim one. It’s an easy swap—simply retool the basic authoritarian state apparatus that became so controversial back in the 1950s for today’s more technologically-advanced society. “While interviewing an author in 2013, Bannon mocked the idea that McCarthy was some kind of “villain.” On the contrary, Bannon argued that the Republican senator and his allies were right in their hunt for traitors. Looking back at that fraught period, President Truman famously said that McCarthy’s HUAC (the “loyalty” committee) was “the most un-American thing in the country today.” Yet, the fringe-right GOP and now the denizens of the White House feel it’s a period worth revisiting. As mentioned earlier, the administration is closely monitoring all Cabinet members for “loyalty” to Trump. How big a leap is it from this to something far more pervasive and deeply unconstitutional? Knowing that McCarthyist-style measures are now viewed as positive certainly puts Trump’s efforts vis-à-vis immigrants (from within our borders and outside them) into a chilling perspective. How big a leap is it from the new “electronics ban” on people entering this country from eight Middle Eastern countries—no one seems to be questioning its legality—to the normalization of much more oppressive measures? Astrologically, there is an important cycle involved in both time periods that deserves a look if we’re going to understand all this. The August, 1947 Saturn-Pluto cycle that took off at 13°+ Leo, and the upcoming January, 2020 Saturn-Pluto cycle that launches at 22°+Capricorn. This approximate 33-year cycle transforms and regenerates the broad power structures and dynamics in societies, influencing the evolution of cultures and civilizations as it does. Needless to say, this rather unforgiving duo can wreak hardship and destruction on societies as part of that evolution process. There was, of course, one additional Saturn-Pluto cycle sandwiched in between the 1947 and 2020 instances—the November, 1982 cycle that launched at 27°+Libra. This is the cycle we are presently seeing through to its completion, so we’ll consider more about it as the discussion warrants. For now, however, let’s investigate how this cycle might have laid the groundwork for that harsh, “Red Scare” McCarthyist era. For that purpose, we’ll set the U.S. and Soviet charts against the 1947 cycle chart in the triwheel below, paying special attention to how the Saturn-Pluto dynamics play out. Triwheel #2: (inner wheel) US-Sibly chart, July 4, 1776, 5:10 p.m. LMT, Philadelphia, PA; (middle wheel) U.S.S.R. created, December 30, 1922, 12:00 p.m., Moscow, Russia (BWH Chart 272, p. 263); (outer wheel) Saturn-Pluto cycle 1947, August 10, 1947, 7:23:37 p.m., Washington, D.C. All charts use Tropical Equal Houses and True Node. 1947 Sun-Saturn-Pluto-Venus conjoin Soviet Neptune (all Leo), semi-sextile Sibly Sun (Cancer) and sextile U.S. Saturn (Libra); the 1947 Sun (Leo) also sextiles Soviet Saturn (Libra). This means, of course, that the U.S. and Soviet Saturns are also conjunct—more on how that plays out in a cardinal t-square in a bit. The Saturn-Pluto cycle favored the U.S. chart in some regards, enjoying a more complex sextile grouping than the Soviet chart did. Even so, bracketed between the Sun and Venus, this cycle conjunction (Saturn-Pluto) almost appears to be a “gift” of sorts—on some levels, to both the U.S. and the Soviets (sextiles to their respective Saturns). This is the period during which both built their super-power status, which in no small way was nurtured by their new adversarial relationship. This relationship basically drove global politics and the balance of power for the next 50 years. On the other hand, the Leo-Cancer semi-sextiles in the U.S. chart (to Sibly Sun) suggest that a great deal of adjusting was also required. This was the post-WWII era, of course, so the U.S. was taking on a greatly-expanded role of leadership in the world, and there were serious challenges. For instance, we had little choice but to help rebuild Europe from the war’s devastation, and not every American politician was on board with the Marshall Plan that helped do this. In addition, some of the agreements forged at the end of the war—especially with the Soviets—opened up their own Pandora’s Box of complications. The U.S. played the lead role in this new organization and the “new world order,” so the timing just prior to the new Saturn-Pluto cycle was more than appropriate. All of this imposed a massive, long-term responsibility on the Truman administration and the nation—in fact, the U.S. presidency and our role in the world were decisively changed during this cycle. Among other developments, the so-called “security state” was established, with the CIA launched in September, 1947 and the NSA in November, 1952. A lot of this threatens to come unraveled under the Trump administration and this lead-in to the 2020 cycle. Pluto was still conjunct the 1947 cycle point in Leo on that day, trine Venus-Mars-Sun (Aries), while Saturn had moved on to the final degree of Leo. An alliance of warriors (Venus-Mars) was blessed by both Sun and Pluto in that chart. Recall that the Soviet Union set off its first nuclear weapon test in August of that same year—without doubt, the threat they felt from the NATO alliance was one reason for that show of strength. The existence of NATO didn’t make the “Red Scare” any less of a panic here in the U.S., however—if anything, the new burdens of leadership placed on the U.S. appear to have raised the volume. To shore up their own defenses, the Soviet Union established an alliance with Warsaw Pact nations in the early 1950s. 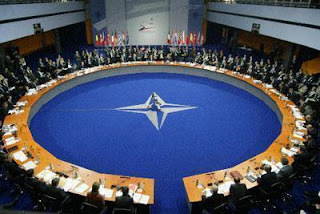 Some of these former allies joined NATO since the Soviet Union’s demise and are now feeling intimidated by Russia’s attempts to draw them back into its sphere of influence. This is a big reason that Europe is a bit freaked out by signs that the U.S. commitment to NATO is on the wane. It’s not surprising that institutions born under the 1947 cycle might be up for reconsideration by now, but this is the type of globally-significant institution that needs careful handling, not reckless, ideological destruction. 1947 Uranus-Mars (Gemini) conjoins Sibly Mars (Gemini), squares Sibly Neptune (Virgo)-Soviet NNode (Virgo) and inconjoins Soviet Venus (Scorpio); Soviet Venus sextiles Sibly Pluto (Capricorn). This set of aspects seems to foreshadow the abusive, delusionary period we call McCarthyism to a tee: The Gemini challenge (1947 Uranus-Mars at our 7th house Mars) would have made the world feel very unstable and unpredictable to Americans, who were undoubtedly still adjusting to post-WWII realities. This would have been reinforced by those Gemini squares to our “American Dream” Neptune. With the Soviet’s Scorpio Venus (sextile our Sibly Pluto) lurking in the background (over our 12th), it’s not surprising that McCarthy could trigger fears of communist “infiltration” (they’re hiding everywhere). The effect this had on America’s ability to discern truth from insinuation and paranoid accusations—“the fake news” of the McCarthyist era, echoes a little too closely today. The Soviet Venus also trined Sibly Mercury, which reflects how deeply our media was caught up in the fear-driven hype. 1947 Neptune (Libra) squares Sibly Jupiter/Sun (midpoint, Cancer) and sextiles 1947 Venus -Sibly NNode (Leo); 1947 Neptune squares Soviet Sun-MC (Capricorn). 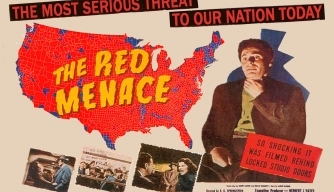 It would be naïve to assume that stirring up McCarthyist paranoia (Neptune square to Sibly Jupiter/Sun) didn’t serve a political purpose—while it denigrated many, it effectively united the average American against the Soviet Union and (even more importantly), the communist system. The Cold War was, in the end, a dialectical war of ideas and economic systems—communism v. capitalism, oppression v. freedom, and while we’re at it, official State-sanctioned atheism v. religious freedom. Stories built around these stark opposing choices and the political intrigue involved became a staple in American pop culture—from “noir” spy thrillers (i.e., James Bond) to productions like Fiddler on the Roof that evoked earlier Russian persecution of Jews. One way or another, Russia and the Soviet Union were cast as the shady, criminal bad guys. Bottom line, the threat narrative was drawn around the freedoms and prosperity (Sibly Jupiter/Sun) we would lose if communist infiltrators weren’t rooted out and banished from society. 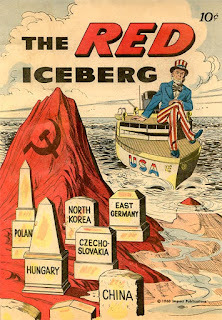 Vilifying the enemy and painting it as the most extremist threat possible, hiding in the shadows (1947 Neptune squares Soviet Sun), was an effective tactic that carried us into the next generation of anti-communist wars in Korea and Viet Nam. These “perks” provided by McCarthyism are not lost on today’s new generation of paranoid politicians (Bannon, especially—Putin, maybe? )­, only now the “threat” they hope to rally around is Muslim. On that note, let’s consider our current national charts alongside this year’s Aries ingress. Triwheel #3: (inner wheel) US-Sibly chart, July 4, 1776, 5:10 p.m. LMT, Philadelphia, PA; (middle wheel) Russian Federation, December 25, 1991, 7:45 p.m., Moscow, Russia (BWH, Chart 280, p. 273); (outer wheel) Aries Ingress 2017, March 20, 2017, 6:16:48 a.m. DST, Washington, D.C. All charts use Tropical Equal Houses and True Node. Looking at this triwheel should dispel any doubts we might have about Russia being a U.S. friend or foe. Clearly, the Soviet Union’s “rebirth” as the Russian Federation (middle wheel) did nothing to soften our relationship: if anything, Vladimir Putin’s destructive designs on us are illustrated pretty clearly. Let’s consider the dynamics between the Sibly and Russian charts first, before we bring the current Aries ingress into the story. Russia Sun (Capricorn) opposes Sibly Venus-Jupiter (Cancer) and squares Sibly MC (Libra); Russia Saturn (Aquarius) conjoins Sibly SNode (Aquarius) and trines Sibly Uranus (Gemini). This illustrates how staunchly opposed Russia is to our ideology (Jupiter) and why they might target our prosperity and security (Sibly Venus-Jupiter). Their hard-nosed Sun is disposed by an equally hard-nosed Aquarius Saturn, conjoined our SNode and trine our Uranus—an interesting “hook” that reflects how they have been using technology (Aquarius) to exploit our weaknesses. The trine suggests that the cyber attacks flow from both sides; certainly it’s common knowledge that surveillance tactics are used by both. Interchart T-square: Russia Uranus-Neptune (Capricorn) opposes Sibly Sun (Cancer); this axis squares Sibly Saturn (Libra). It was quite an “accident” of history that the Russian Federation rose from the ashes of the Soviet Union under the final stages of the 1821 Uranus-Neptune Capricorn cycle, and a mere year and a half from the new 1993 Capricorn cycle. There are civilization-transforming implications in this, but there is also a continuity of hard-nosed ambition and a deeply held sense of their powerful place in geopolitics, and in the history of civilization itself. It’s not hard to see that our government institutions are in the Russian crosshairs here, with the aspects to Sibly Sun (Executive) and Saturn (Congress). Current news is filled with examples of Russian efforts to undermine our structures and national reputation (recall the Russian Sun squares Sibly MC, as well). Russia Venus-Pluto (Scorpio) trine Sibly Mercury (Cancer). Influencing our Mercury is a multi-layered operation: manipulating public perception through a cyber-avalanche of paranoid “fake news,” which is then used to undermine our relationships and defense capabilities (Gemini 7th house is ruled by Mercury). There’s no accident that Trump’s Gemini stellium (Sun-Node-Uranus) plays into all this, conjunct Sibly 7th house Mars—is it any wonder he and his campaign are being investigated for enabling this Russian influence? Interchart Mutable T-square: Russia Mercury/Mars (midpoint)-Sibly ASC (Sagittarius) opposes Sibly DSC-Uranus/Mars (midpoint, Gemini); this axis squares Russia Jupiter (Virgo). Russia’s restless aggression shoots across the Sibly horizon here, destabilizing our self-image (ASC) and 7th house defense capabilities; the t-square reflects that there’s a connection between their growth (Jupiter) and the use of “information war” (Mercury/Mars) against us (7th house Sibly Mars/Uranus). Russia’s Jupiter is elevated over our Sibly 10th house, very widely conjoined Sibly Neptune (Virgo), so it’s not surprising they might use our “American Dream” against us in some way in their “infowar” (which is ongoing, we’re told). Attacks on social media were the obvious way to leverage our biases, preconceptions about politics, and so on. The oppositions in this t-square reflect Russia’s perennial ambitions for a “parity” of power with us, and their Jupiter provides some leverage. On an interesting, related, but totally unsubstantiated note, there are theories circulating that Russian steel is being brought in through Canada for the pipeline projects that Trump has green-lighted, much to the dismay of environmentalists and Native Americans. If this were true, it would be the cynically ironic about-face that many would expect from him, considering he claimed U.S. steel pipes would be required for these projects and then reversed course. This becomes relevant here because Russia’s Sagittarius Mercury/Mars opposite our Sibly Mars/Uranus suggests the involvement of steel (Mars) on both sides. We are seeing more about confirmed connections between Russian oligarchs and Trump, (Russia Jupiter sextiles and Russia Pluto-Venus widely trines Sibly Sun), and business deals would not be inconceivable. This is a wait-and-see possibility—again, unconfirmed. Let’s turn now to the impact this month’s Aries ingress (outer wheel, Triwheel #3) has on these two national charts and what it might portend for that relationship in the coming year. Interchart T-square: Russia Sun (Capricorn) opposes Sibly Venus-Jupiter (Cancer); this axis is squared by Ingress Sun-Venus (Aries). The Aries ingress stresses out our Russian relationship every year, given these cardinal points, but the addition of an Aries Venus at the ingress suggests that more is at stake this time around. This Venus actually squares Russia’s entire Capricorn stellium (Sun, Node-Uranus-Neptune) and pulls the Sibly Sun into the mix, as well, so they have something to gain or lose from their anti-U.S. ambitions this year. A friendlier presence in the White House, perhaps? Interchart Mutable Grand Cross: Ingress Neptune (Pisces) turns the Mutable T-square discussed above into this more stressful grand cross. This certainly reflects the use of distortion and ­“fake news” that will likely continue to destabilize our relationship. It was certainly powerfully reflected yesterday, in House Intelligence Chairman Devin Nunes’ decision to blow up his committee’s investigation into Trump/Russia ties. Ingress Saturn-Moon-GC (Sagittarius) sextile Sibly Moon (Aquarius), square Sibly Neptune (Virgo) and trine Ingress Uranus (Aries). The gathering at the GC will continue inspiring leaks and whistle-blowing, and the sextiles suggest that this could benefit the American public. The square to Sibly Neptune (Virgo) will continue stressing out our national “spin-doctors.” We have to wonder how much longer Press Secretary Sean Spicer is going to hang on. The volatile Ingress Uranus (Aries) trine to these Sagittarius points suggests that some revelations may literally be explosive or at least, brutally shocking. Could such revelations cause shocking, or uncontrollably volatile responses? These Sagittarius and Aries points do tie into Russia’s Leo Ascendant, creating a fiery grand trine, so this possibility isn’t too far-fetched. We may see some recklessness on their part, where they would normally calculate their moves carefully (their Scorpio Pluto-Venus squares their ASC). Interchart Grand Earth Trine: Ingress Mars (Taurus) conjoins Russia MC (Taurus), trines Russia Sun-NNode-Uranus-Neptune (Capricorn) and trines Russia Jupiter (Virgo). The year ahead seems to support Russian ambitions, especially in substantive, “earthy” ways. Mars isn’t particularly comfortable in Venus-ruled Taurus, but its placement there fits a determined plan to build its world image (MC) around resource-based revenues (keep an eye on that steel deal). Ingress Mars inconjoins Russia Mercury, so they may try to “spin” any plans they have in the works. Interchart Cardinal Grand Cross: Ingress Jupiter (Libra)-Sibly Saturn (Libra) opposes Ingress Uranus (Aries); this axis squares Ingress Pluto (Capricorn)-Russia Uranus-Neptune (Capricorn) opposite Sibly Sun/Mercury (midpoint, Cancer). This tense cardinal tug-of-war pits Congress (Libra) against the volatile unknown (Aries), and whatever happens there will impact U.S.-Russia power dynamics. How Trump communicates (Sibly Sun/Mercury midpoint) reflects that relationship, especially with Ingress Neptune trining that point, enabling a constant river of false claims and obfuscations. The tension in this configuration reflects the difficulty at getting to the bottom of the ongoing investigations. We will probably see some subpoenas issued to Trump surrogates and associates (Ingress Saturn quincunxes Sibly Mercury). Whether the Trump camp will be able to count on more Wikileaks releases timed to distract from the investigations remains to be seen, but with the fiery grand trine discussed above, there will likely be more surprises before it’s all behind us. So, is a newly reimagined wave of McCarthyism supported by all this intrigue and mounting tension between the U.S. and Russia? The chilling thing about the alt-right effort to rehabilitate this dark period of our history is that there’s a new “enemy” fixed in their paranoid sights, and it’s Muslim, rather than Russian. Russia, in fact, is seen by people like Steve Bannon as a possible ally in a new anti-Muslim “Scare” campaign. It’s not hard to imagine how this goes: first, there’s a travel ban (or watered down, the new “electronics ban”), then a story blows up in the news that convinces people immigrants from Muslim countries are the enemy, much to be feared (UK just provided one), then enough of us look the other way as the ban on travel is quietly reinstated. What’s next? Cover for those who commit heinous hate crimes? Round-ups within our borders? They’re already happening for many immigrants—if it looks like tyranny taking over in baby-steps, it probably is. Bottom line, exaggerated concerns about “national security” can wash away a lot of our human and civil rights overnight, if we’re not vigilant. Trump’s Cabinet secretaries are feeling the heat of suspicion, our welcoming image in the world is already being destroyed, and Trump and Co. are just getting started. Those who want to slam our borders shut and roll-back the civil rights progress we’ve made since the 1947 Saturn-Pluto cycle launched are counting on the power of suggestion, innuendo and insinuation. We may not have just one enemy to vilify in McCarthyism 2.0—anyone who threatens Trump priorities in any way could find their way onto that list. It’s worth remembering that the Viet Nam/Watergate crisis of confidence in our government (early 1970s) marked the waning phase of that staunch 1947 Leo cycle; the remainder of that cycle was spent in a serious recession at home and a stubborn Iran Hostage Crisis, both of which destroyed President Jimmy Carter’s chances of re-election. We are now in the waning 3+ years of that 1982 Saturn-Pluto cycle (Libra), and we have a situation that is eerily similar to the 1970s, with another president being investigated. This time, however, the potential crimes at stake are orders of magnitude more serious. In fact, judging from our dicey internal and external power dynamics, the situation warrants urgency. IMHO, we need to hope that Bannon’s stated intent to “deconstruct the administrative state” (we can read, “to facilitate an authoritarian takeover”) isn’t a preview of things to come. The closing days of a cycle like this usually do involve the dismantling of outworn structures and a “de-cluttering” of bureaucracies—even some notable cultural and demographic shifts; however, there’s a difference between a productive clearing process and purposeful, systems-busting destruction. We have some choices about how close to the bone this clearing out process should cut, but unfortunately, it appears this time around that we can’t take our leaders’ commitment to democratic ideals for granted. Maybe it’s time to hold our “hired hands” (we do pay their salaries) to account? In the next post, we’ll examine that new 2020 Saturn-Pluto cycle in greater depth—the road between now and then is going to be an interesting ride! Nicholas Campion, The Book of World Horoscopes, 3rd ed., The Wessex Astrologer, Bournemouth, UK, 2004.